Natural, biodegradable and safe for the environment, Ecoleaf Washing up Liquid is derived from plant extracts and is based on biodegradable, sustainably sourced ingredients. Vegan friendly and brought to you in recyclable bottles, Ecoleaf Washing Up Liquid will help you to clean your plates with a squeaky clean conscience. Directions for use: One squeeze is enough for a sink-full of normal dirty dishes. Save money and resources by buying in bulk: buy Ecoleaf Washing Up Liquid in a 20 Litre bottle. Water >30%, Plant derived anionic surfactants 5-15%, Plant derived non-ionic surfactants 5-15%, Plant derived amphoteric surfactants 5-15%; also contains natural fragrance, benzisothiazolinone and d-limonene. The Ecoleaf Washing Up Liquid - 5L product ethics are indicated below. To learn more about these product ethics and to see related products, follow the links below. 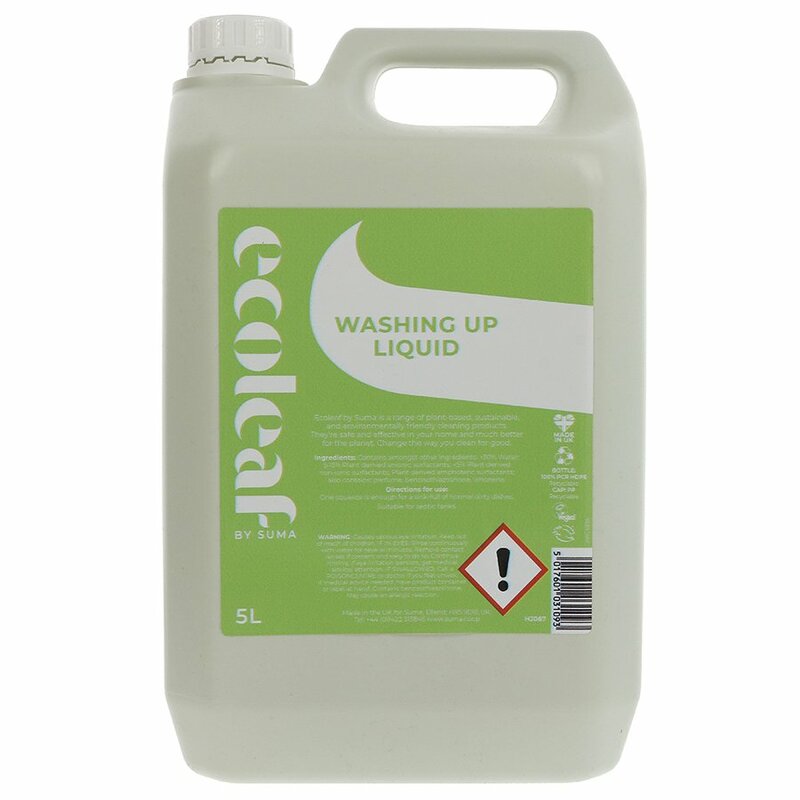 There are currently no questions to display about Ecoleaf Washing Up Liquid - 5L. Ecoleaf offer a unique range of eco-friendly cleaning products, derived from plant extracts that are non-toxic and safe to use, and they're proud to do so. Their range is derived from plant extracts and are based on biodegradable, non-hazardous ingredients, rather than on chemicals which most household brands rely upon. Ecoleaf base their manufacture in the UK, reducing their carbon footprint for UK customers. Their bottles and containers are recyclable and they offer their products in bulk, to reduce the need for further bottles to be produced. All their products are suitable for vegans, and are animal cruelty free.